Since the age of ten, Patrick Tawil has been fond of zoology, notably animal evolution and classification, and especially those of vertebrates. When he reached 13, Patrick turned an empty apartment of his home building into a kind of Noah’s arch, with many types of birds and rodents, without the neighbour’s knowing. When his clandestine activities where discovered 9 months later, he had to restrict to aquarium fishes. Patrick first tank was a kind of big plastic bubble a few dozen litres in volume initially intended for effervescent tablet advertising. The main host of this "aquabubble" was a Thorichthys meeki, whose refuge was a big triton (Charonia) shell. Once in France, his interest focussed early on cichlids, because of their easy care, but overall because of their ecological adaptations and their astonishing evolutive convergences. The Lake Tanganyika cichlids, with their many lineages, became his favorite, immediately followed by those from Lake Malawi. Patrick could acquire a practical experience about sucessfully keeping them and the behaviour of most of these two lakes cichlid genera, as well as some of other african genera. Later, he translated many aquaristic books for Tetra editions, and contributed to french aquarist periodics. 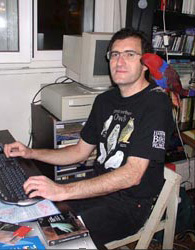 A member of the AFC (the french cichlid association) since its foundation, he has contributed on a regular basis to its monthly bulletin, of which he was the editor for several years. Patrick currently collaborate to the yearbook of the association, "L’An Cichlidé".